GIGINYU PRIMARY SCHOOL in Kano, the largest city in northern Nigeria, should have been bustling on the morning of February 16th. It is one of 119,973 polling stations for Nigeria’s presidential election, which was scheduled to take place that day. Instead it was almost deserted. A goat ambled past the school’s locked gate, followed by a couple of chickens. Just hours earlier, as most Nigerians slept, the country’s Independent National Electoral Commission (INEC) had announced that it was not yet ready to hold the vote, which would instead be postponed by a week until February 23rd. Having steadfastly denied for months that there would be any difficulties, its officials issued excuses faster than a ballot-box stuffer could stuff a ballot box: it couldn’t print the ballots because it did not know who was supposed to be on them; bad weather grounded planes that were meant to distribute voting materials; potholes delayed the lorries it rented to replace the flights; some of its offices were burned down. By the end, even the commission’s officials sounded confused about why they had postponed the elections at such a late stage. “Until the eleventh hour, they gave us assurances that everything would be fine,” says Benson Olugbuo of the CLEEN foundation, an NGO monitoring the vote. Most observers believe that the delay was caused by INEC’s incompetence, and that this is not a sign that the government is trying to change the outcome of the election. International observers and NGOs have offered tentative support, saying a delayed poll would be better than a badly flawed one. Even in states not affected by fires or bad weather, observers at polling stations said the materials had not arrived by Friday night. For Nigerian voters, these events are all too familiar. The previous two presidential elections, in 2011 and 2015, were also postponed. In 2015 INEC announced a week before the election’s original date that it would be moved back by six weeks, arguing that the Boko Haram insurgency raging in the country’s north-east had disrupted their preparations. This year’s delay is more like that of 2011, when INEC declared at noon on voting day that it was simply not ready, and that it would try again in a week. “INEC consistently over-promises and under-delivers,” says one expert on Nigerian elections. With the election likely to be close, the delay has raised the level of tension in the country. The People’s Democratic Party (PDP), the main opposition party, accuses the ruling All Progressives’ Congress (APC) of plotting to rig the vote. 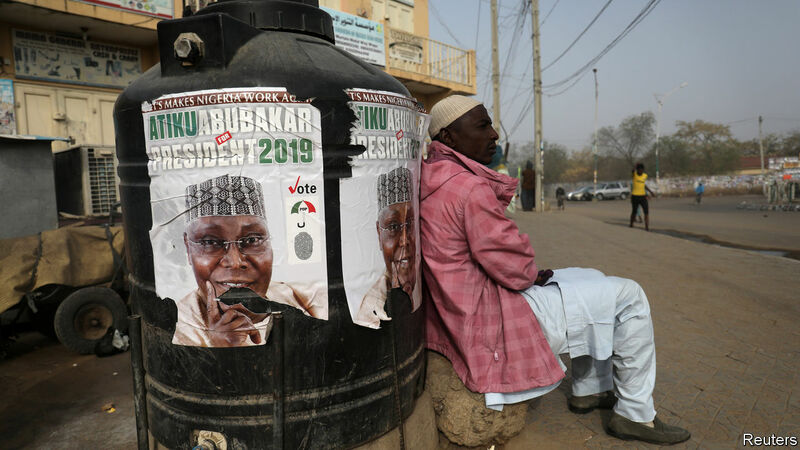 If the PDP’s candidate, Atiku Abubakar, loses, it will probably challenge the result in the courts. Muhammadu Buhari, the president, is expected to do the same if the result goes the other way. In Sabon Gari, a part of Kano mostly populated by Christian migrants from the south, many are nervous for a different reason. The area has seen violence after past elections between residents and members of Kano’s Muslim majority. The delay has prolonged a tense wait for this election to be over. “We are afraid,” says Victoria Ogbase, who owns a restaurant in the area, and usually goes back to her village in the south during elections. Unable to afford to do so this year, she plans to sit behind the locked doors of her restaurant on February 23rd and wait it out. Most Nigerians have reacted with a mixture of resignation and annoyance. “It’s a tradition in this country,” says Sabo Ibrahim, a civil servant who lives opposite Giginyu Primary School. “So I wasn’t surprised when I heard.” But he says a few voters had still showed up at the school earlier that morning; some because they had not heard about the delay, others to make sure it was not fake news. With movement restricted and shops closed on voting day, people are irritated at the disruption the postponement has caused. That disruption is most severe for the large number of Nigerians who travelled back to their hometowns just to vote. “I felt very let down,” says Colin Egemonye, a lawyer in Lagos who went to Anambra state, in south-eastern Nigeria, to vote. Although he plans to make the journey once more on the 23rd, he worries that the delay will dampen voter turnout, which was already expected to be low. In 2015, it languished at just 44%. Many of his fellow citizens either cannot afford to travel again, says Mr Egemonye, or “are just so disenchanted they won’t bother”.